Sihaya Hopkins uses one hand to spin a glass bead and the other to melt a rod of a different color to layer onto the bead. Using a propane-oxygen flame hotter than 3,000 degrees and a rod of Italian glass, Sihaya Hopkins twirls a red-hot lick of molten glass around a steel rod. Soon, a glass bead forms of blue and red, or gold and green, ready to cool down by degrees in a kiln. The long, slow cooling process ensures that the bead doesn’t crack, today or one year from now. 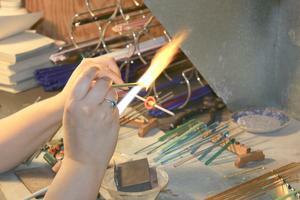 Hopkins works in the lampwork style of fine glass craft, a process that predates glass blowing. Owner of Blossom Studio, now celebrating its 20th year on the Blue Hill Peninsula, Hopkins has run galleries in Deer Isle and Brooklin, carrying her own and other artists work, while creating an inventory of her own jewelry and designs for shows, wholesalers and other galleries. She has seen her jewelry around the neck of strangers on the Boston subway and on a city street. Once, her aunt called to tell her a woman on an Antiques Roadshow program was wearing one of Hopkins’ designs. 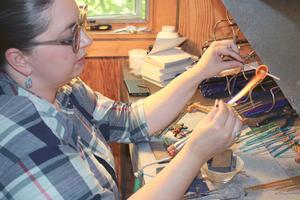 Hopkins’ first learned her craft while enrolled in a semester of metalsmithing at Worcester Center for Crafts. She took a glass work class and switched her focus. But first, she began stringing pearls. As a teenager, her parents moved the family to the Alaskan wilderness, where they carved a life in the Prince William Sound bush as oyster farmers. On a trip to San Francisco, Hopkins’ aunt showed her how to knot pearls on silk thread and, before returning home, she invested her oil company dividend (distributed to every Alaskan resident) in a supply of pearls. “I spent the next six months making pearl necklaces,” she said, and found boutiques to carry them. But a trip “to town,” Anchorage or the Matanuska Valley, was at least a 12 hour drive, and a new supply of pearls could take months to arrive. Along with plenty of free time, life in the bush also meant that mail delivery only came every two to three months. But it was Hopkins’ early venture into the pearl necklace business that let her know she could make a life with her art. “I knew if I took something seriously and did it thoroughly, I could turn it into a lucrative business,” she said. When her family moved to Brooklin 21 years ago, Hopkins waitressed while renovating a woodshed into a studio. Today, she is still heating glass rods and creating designs and jewelry, work that has evolved has she fine-tunes her craft. After her Brooklin gallery closed in 2013, from a combination of the economic recession, the Blue Hill rotary construction, and her own ill health, Hopkins took a year off. At the time, she had undiagnosed Lyme disease for 12 years, and while she said joint and back pain didn’t keep her from working, an onset of vertigo did. She opened a holiday pop-up in Blue Hill in 2015 and then just kept it open. Her glass jewelry and designs fill the store, while the walls are hung with work by her sister, Kipp Sienna Hopkins, the only other artist whose work she carries. Her Lyme disease, finally diagnosed a couple years ago, is being treated and she is on the slow road to health. Meanwhile, Hopkins’ continues to look to the future: when her kiln broke she invested in a larger replacement, to accommodate bigger projects. With safety goggles firmly in place, she slowly rotates a sphere of glass through the flame, marking its molten surface with a patterned design. Using a propane-oxygen flame over 3,000 degrees, Sihaya Hopkins works in the lamp glass tradition that predates glass blowing. 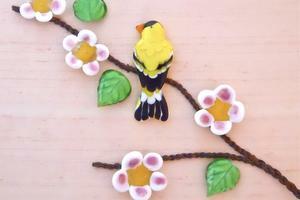 A bird on a branch, designed and created by glass artist Sihaya Hopkins.